Here, as you can see, we've planted about 200 trees. One of the initiatives carried out by the watershed agencies involves restoring vegetation along the riverbanks. Here, we are next to the Saint-François River. This project aims to restore the shorelines here in our community. We received a lot of trees through the Saint-François watershed agency, which we planted in various places. In 20 or 30 years we should have trees all along this shoreline. 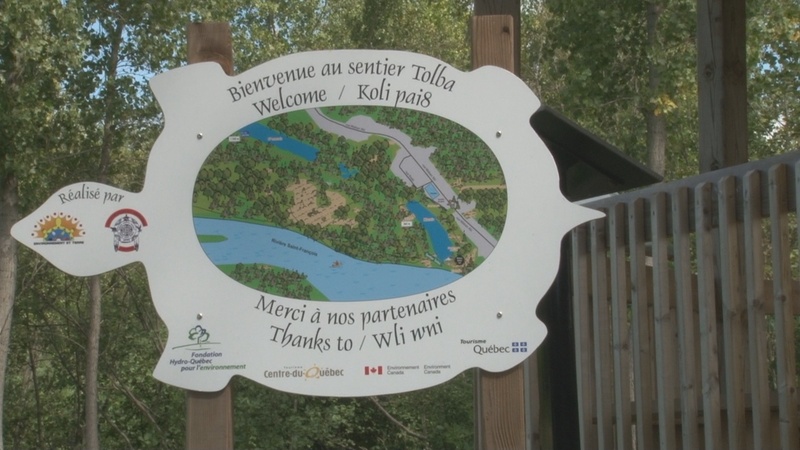 The Tolba trail is an interpretive trail that focuses on Abenaki medicinal plants. This trail enables visitors to learn about plants traditionally used by the Abenaki nation in their natural habitat. What's great about it is that you can walk through the woods, in a natural environment, see the plants and learn their traditional uses. We included the Abenaki names of these plants, to add more cultural information. We also list their medicinal and other uses. Like here, this big pine tree, called "koa," was used for its needles and its resin. We also include information on cultural practices related to the plants. So for this pine, there was a traditional dance that involved pine needles, which symbolized coming together to preserve Abenaki culture. Along the trail, there are thirteen panels like this one that discuss medicinal plants. In addition to these panels on medicinal plants, there are also three larger panels: two discuss animals and the third presents an overview of the Tolba trail and the Tolba project. You can come here for a stroll in the woods, and also learn all sorts of things. The information is presented next to the plants, allowing visitors to get to know their environment and how they are used; you can even touch them, smell them, eat them. You can eat the plants that are edible; that information is included in the panels. It's important to realize that this information isn't available anywhere else. A lot of books have been written about the medicinal plants of Quebec, but when it comes to how these plants were used by First Nations, in their communities, there hasn't been much research on that topic. There has not been much focus on the plants of Quebec. What's interesting here is that we have typical Quebec plants that were used by First Nations, and we present how they were used. Most of the information comes from a book written by Michel Durand, "Les plantes du soleil levant" (Plants of the Rising Sun), on traditional plants used in Abenaki culture. We started in 2006-2007. That's when we took our first steps and applied to start a species at risk project with Environment Canada. That's when we started taking inventory. Our first project involved herptiles. Herptiles include turtles, snakes, frogs and salamanders. The project was intended to take an inventory of the herptiles and a portion of the vascular plants in the region. The Odanak band council got on board with our project. They understood that to create a finished product, you have to start with the basics. So if you want to create an interpretive trail and attract visitors, first you have to know the environment. You have to know what's there and how to use it. Now we've reached the final stage of the project, with the interpretive trail itself a gazebo and a lookout. This is the lookout; it's the central point of the interpretive trail. You can see turtles, watch birds. All the projects we worked on, the inventories of birds and turtles, they all tie into Abenaki culture. The turtle is a sacred animal for us and many other communities, because according to legend, the world was created on the back of a turtle. And when we talk about vascular plants and medicinal plants, there's a strong cultural element to that too. People still use Medicinal plants in our community. As for birds, a lot of people have told me you can see Bald Eagles here. They are such majestic birds. We might see one fly overhead. The Bald Eagle is also part of our culture. Why did we build the lookout here? This marsh has the greatest concentration of herptiles. There are frogs: Bullfrogs, Grey Treefrogs, Spring Peepers, Green Frogs, Leopard Frogs, and more. There are also turtles: Painted Turtles, Snapping Turtles. When we were taking inventory, this is where we found the greatest numbers of these two species. If you face the marsh, you see a nice forest, but it isn't very wide. There's a road right behind it, a pool, a parking lot, a playing field, some homes. The turtles would come out of the marsh and they would get hit by cars or end up being disturbed by all sorts of people while they were trying to lay their eggs. So we built a fence to contain the turtles, and keep people from disturbing them. We also set up artificial egg-laying sites. Because the fence prevented them from accessing their old egg-laying sites—the playing field, the area near the pool, the parking lot—we had to create artificial egg-laying sites to give them an alternative. The first year we set up egg-laying sites, and when we came back the next June, in egg-laying season, it was very busy. Several hundred turtles laid their eggs there, for the first time. We were extremely satisfied with the results. This means that the sites were set up properly. Of course we worked with a herptile specialist. The two turtles... you could see a Painted turtle laying her eggs right next to a Snapping Turtle, also laying her eggs. These two species coexist very well. They are not enemies, but it's rare to see them together. Painted Turtles are much more common. They are often seen in groups. You can see them basking in the sun on a tree trunk. There can be up to 15 or 20 turtles sitting together. They sit there and bask in the sun. As for Snapping Turtles, you'll only see one at a time, and much more rarely, because these turtles are much more shy. They keep to the water and stay more hidden. That's because their defence mechanisms are less effective than those of the Painted Turtle. The Painted turtle has a larger plastron and a rounded carapace, and can retract all of its appendages into its shell. The Snapping Turtle has a flatter carapace, and its plastron is relatively smaller. It is unable to retract its appendages. So it's easier for predators to attack it. People have misconceptions about turtles. They think turtles are slow, they think they can't see very well. Those are all urban legends; turtles can see very well. It's incredible! They also have highly developed hearing. And they can move very fast.